and what I am doing since I retired in 1967.
as carrying a BAR, in a rifle Company. said, No thanks, and returned to Santa Ana, where I retired. about the Marine Corps League and joined in 1968. Year from the Pound and Pack. In 1993 received the Past Chief Devil Dog�s award. 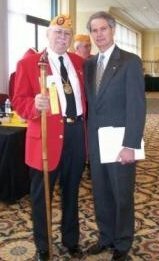 Marine Corps League's Marine of the Year Award. I am still working for the League, the Dogs and all Veterans rights. Only a total now of sixty (60) years so far for the Corps and the Country I love.